Stone Age farmers lived through routine violence, and women weren't spared from its toll, a new study finds. The analysis discovered that up to 1 in 6 skulls exhumed in Scandinavia from the late Stone Age — between about 6,000 and 3,700 years ago — had nasty head injuries. And contrary to findings from mass gravesites of the period, women were equally likely to be victims of deadly blows, according to the study published in the February issue of the American Journal of Physical Anthropology. Linda Fibiger, an archaeologist at the University of Edinburgh in Scotland, and her colleagues focused on the late Stone Age, when European hunter-gatherers had transitioned into farming or herding animals. Mass graves unearthed from that time in Talheim and Eulau, Germany, contained mostly males who had died in violent conflicts. As such, researchers had thought women were spared from conflicts due to their potential childbearing value, Fibiger told LiveScience. But looking only at the aftermath of big, bloody conflicts can obscure the day-to-day realities of Neolithic farmers. "It would be like only looking at a war zone to assess violence," Fibiger said. "That's not going to tell you what's going on in your neighborhood." To see what more humdrum days looked like for these Stone Age farmers, the team assessed 478 skulls from collections throughout Sweden and Denmark from between 3900 B.C. and 1700 B.C. They distinguished bumps due to falls or accidents from violent wounds, which might leave evidence such as an "axe-shaped hole in the skull," Fibiger said. 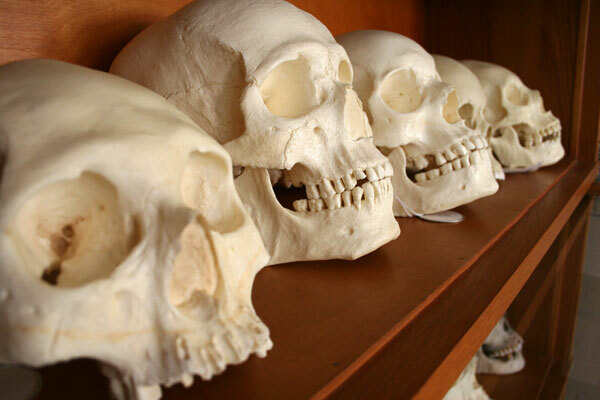 Nearly 10 percent of the Swedish skulls exhibited signs of violent injury, and nearly 17 percent of the Danish skulls had such wounds. Men had more nonfatal injuries, but women were just as likely as men to have lethal head wounds — which can be identified because they never healed. That suggests these ancient herders routinely experienced violence, likely due to raids, family feuds, or other daily skirmishes with competing groups, Fibiger said. Domestic violence could be a factor, but proving it requires looking for repeat injuries and wounds to the ribs and torso, Fibiger said. Given that skulls and skeletons are jumbled up at these sites, and many skeletons weren't preserved, that's not possible, Fibiger said. The findings are impressive, said Christian Meyer, an anthropology doctoral candidate at the University of Mainz in Germany, who was not involved in the study. "It's one of the first that really looks at a really large sample size, and it draws from a larger region," Meyer said. Analyzing so many Stone Age skulls allows researchers to quantitatively compare rates of such violence throughout Europe at the time.